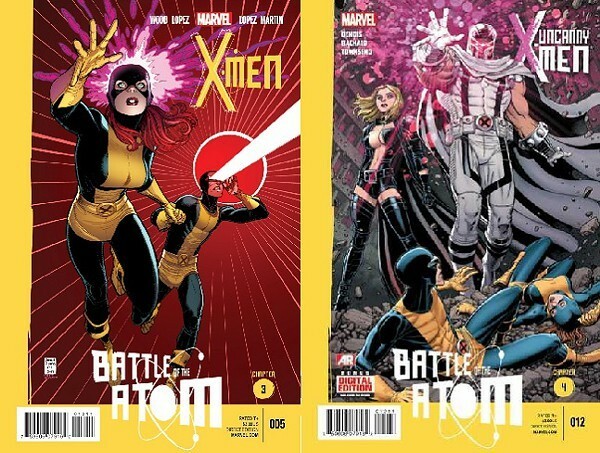 Last time we took a look at Battle of the Atom, the latest mutant-packed event from Marvel, everything seemed off to a solid start. Brian Michael Bendis had pulled off something miraculous: He crafted a time-travel story with the X-Men that seemed both exciting and fresh. Injecting past and future characters into X-tales has been done many, many times before, but the device seems like a perfect fit to resolve the current mutant dilemmas. But there are issues that arise from having so many characters within a smaller-scale event (by Marvel standards). And at times, it seems like the scribes behind Battle of the Atom lean a little heavy on the telepaths and teleporters for narrative support. So as we've done before, let's take a look at a play-by-play for the two newest chapters for the event, and see how exactly these issues come up. Chapter 2 of Battle of the Atom ended on a desperate note, as the younger Jean Grey and Cyclops escaped from Wolverine's team, which had voted to send the forward-time-travelers back. In Chapter 3, Team Wolvie (along with the X-Men of the future) are in pursuit of the duo, with the help of Charles Xavier's grandson following the psychic trail of the escapees and a new jet created by the Beast. As Rachel Summers and Kitty Pryde stay back at the Jean Grey School, the conversation leads to whether or not these kids should have the choice in whether to return to their appropriate time or not. Ultimately, they decide to dissent with the popular opinion, despite the dangerous potential consequences. Team Wolvie catches up with the pair (who have meanwhile upped the sexual tension in the most awkward sense) and it seems like it's all over. That is, until Rachel and Kitty follow through on their idea to disrupt the capture. Somehow, with all of these incredibly powerful mutants present, young Scott and young Jean escape again. I'm still not sure how all of these characters follow each other around so easily. Earlier in the issue, Jean mentions getting help from someone unexpected. The big reveal at the end of Chapter 3 is that this someone is none other than the X-team led by present-day Cyclops. Cue the dramatic score. At the beginning of Chapter 4, we're taken to the S.H.I.E.L.D. Helicarrier, where scribe Bendis provides a quick scene just to remind us that the government is a major player in this story. We're also reminded that multiple parties think it's in the best interest of the world to send the youngsters back to their era. Back with young Jean and Scott, the two are discussing the situation with modern Cyclops and his merry band of morally ambiguous mutants. The thoughts of Jean and Scott are projected, showing everyone what had transpired within the last 24 hours. And as part of a growing trend, Cyclops has a hard think on what to do. Oh, and Magik disappears again - presumably to visit the future. Meanwhile, Team Wolvie continues to debate its stance on giving the young X-Men free will. Cyclops eventually says "yes," but pretty much everyone else goes the other way on this one. Emma Frost and Magneto, in particular, make their objections known, but when Team Wolvie shows up, things come to a head once again. Emma claims responsibility in garnering the presence of Team Wolvie (concluding our game of Musical Battlegrounds), but changes her mind once she figures out that the Xorn character forcefully retrieving young Jean Grey is, well, the older Jean Grey. A cat fight is nigh. And that's chapters 3 and 4 of Battle of the Atom. It's not quite as filled with turns as the previous group of chapters, but the inevitable all-out battle finally seems close. * Brian Wood's handling of Chapter 3 deserves some recognition. With multiple writers collaborating on a single event, sometimes the voice of the characters becomes uneven. Not with Wood and Bendis, as both the action and the humor stay consistent. * Is Hill's dream about the X-Men blowing up the moon some kind of foreshadowing? I don't know; maybe I've been watching Breaking Bad too much to not read into this moment in Chapter 4. * Is Cyclops going to give those clothes or, most importantly, that motorcycle back? For a "boy scout," he sure doesn't have any qualms about stealing. * The X-Men of the future will hopefully be explored more in the coming issues. There has to be some reason Bendis decided to add several characters to a storyline that already contains dozens. Mostly, I just want to know what's up with Deadpool these days. * There are a lot of telepaths in this story, blocking one another from psychic perspectives, communicating via thought balloon, and generally just thinking really hard in each other's direction. It seems a bit much at times, posing the question of whether or not we need so many of the mutant type in this tale. More importantly, do we need this many mutants of any kind for this story? Would it be any less interesting of a tale if it had just been the female Xorn who came from the future? Let me know what you think.